Looks like the Daily Mixed has arrived in Thunder Mesa with the mail and express parcels. 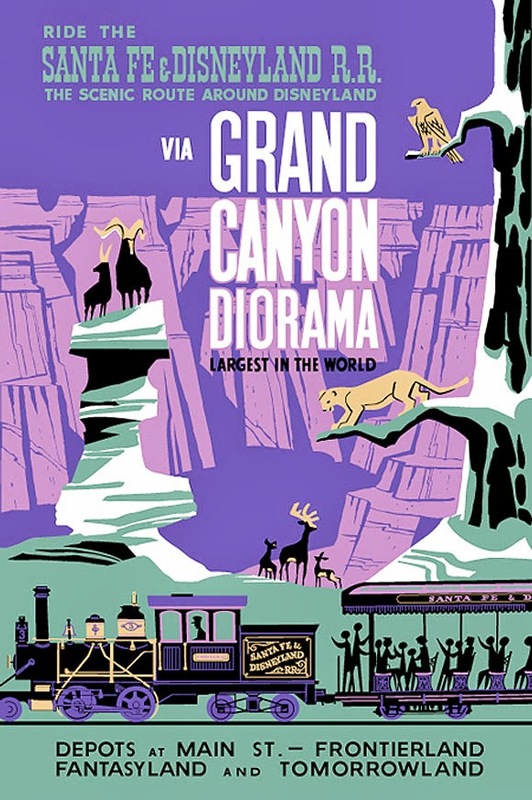 The Santa Fe, Denver & Carolwood combine is a magazine article project I've been working on for the last several weeks. Apologies to regular readers for the lack of update last week and a very meager one this week. I'm afraid the blog must take a back seat while I finish up a slew of real world and 1:1 scale projects that have been demanding my attention. Should be a short break however and with any luck I'll be back on track with a full update next week. 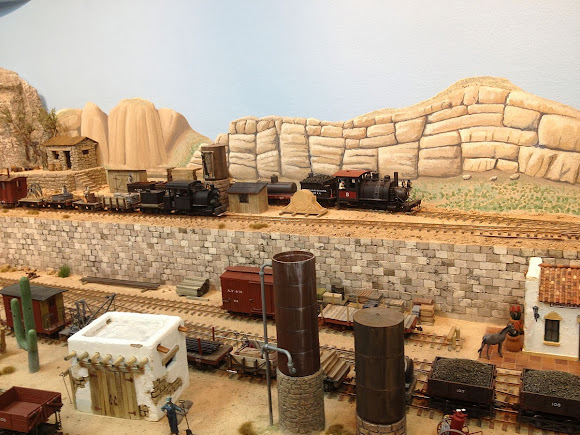 Earlier this year, Thunder Mesa Mining Co. #1, the Marc F. Davis, took a trip down to the wild Sonoran Desert town of San Lorenzo for a run on Verne Niner's fantastic Estrella & Sonora Grande Railroad during the first meeting of the Arizona On30 Desperados. The One Spot takes a spin on the San Lorenzo turntable. 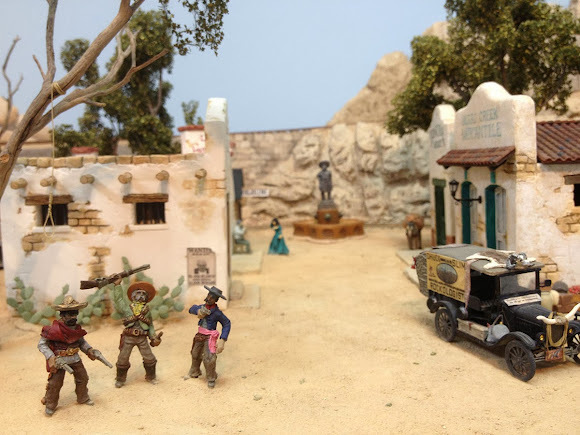 The Estrella & Sonora Grande does a wonderful job capturing the look and feel of a down-on-the-heels desert mining line. Downtown San Lorenzo. Always a good idea to keep an eye out for banditos! The local crews aren't quite sure what to make of an odd critter like the Marc F. Davis. Meanwhile, a potentially catastrophic pairing of cars waits on the San Lorenzo siding. Verne's great sense of humor and attention to detail really come through on scenes like this. I designed the graphics for the Lytum & Hyde car and Verne painted, decaled and detailed the 18' Bachmann boxcar. 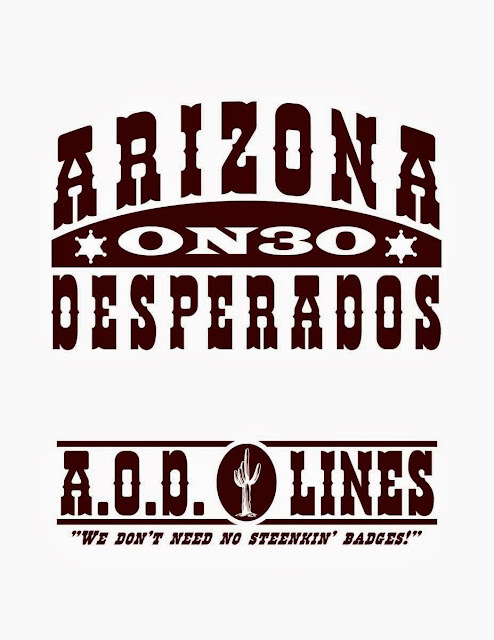 Many thanks to Verne Niner for hosting the first meeting of the Arizona On30 Desperados. Our motto is "We don't need no steenkin' badges!" Members share a light-hearted and fun approach to the hobby and a passion for funky old Southwestern narrow gauge lines. In addition to running some trains on Verne's layout, we also had a great cactus building clinic led by Travis Handschug. Thanks to Travis, I'm now replacing all of the big cacti along the Thunder Mesa line with better looking models inspired by his techniques. There was also discussion of combining all of our modeling efforts on a portable/modular layout in the future, but those plans are still up in the air at this time. The next Desperados meeting will be here in Thunder Mesa country. Stay tuned for more updates on this informal little club. 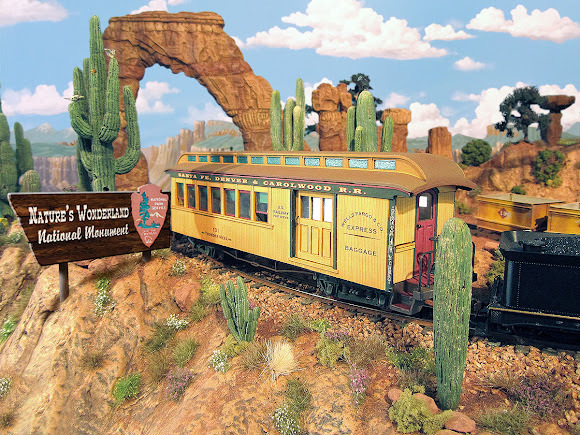 Be sure to check out Vern's wonderful layout, as well as all of the great modeling tips and how-to's on his website. My Blogger stats have shown that lots of folks seem to enjoy looking at track plans. With that in mind, the Track Plan page is now Track Plans, plural. 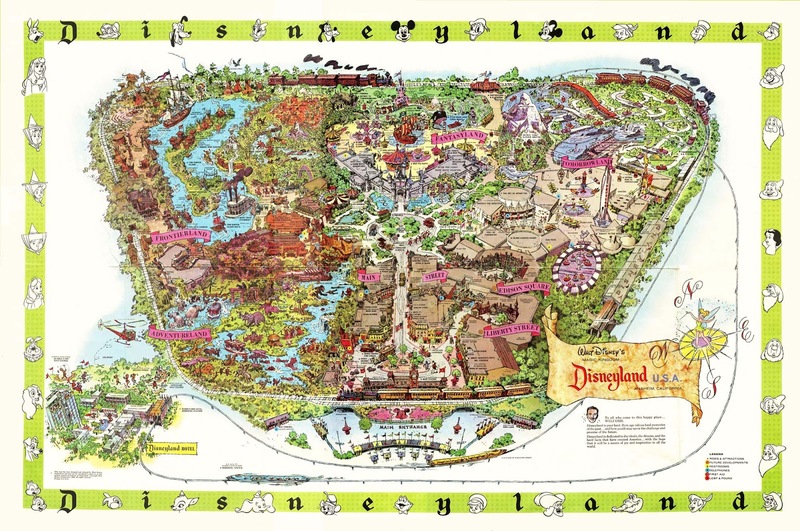 The page has been updated with drawings in On30, HO and HOn30, showing the evolution of ideas for Thunder Mesa - from Nature's Wonderland and the Big Thunder & Western, through some current possible expansion plans for an On18 Calico. 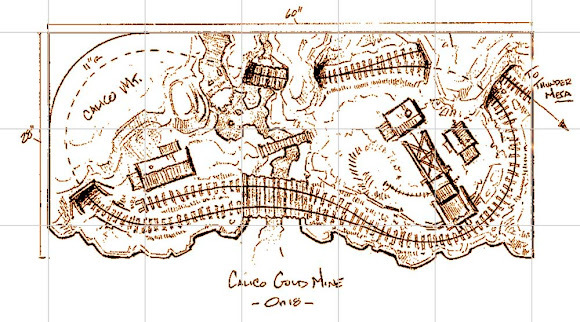 I love to draw plans, and a new Grand Plan for the entire layout is in the works so the page will be getting updated again soon. "I just want it to look like nothing else in the world... and it should be surrounded by a train." I do not clearly remember my first visit to Disneyland, it was 1966 and I was four years old at the time. I do remember the train. It gleamed in the California sunshine, chuffing, hissing, a living, magical thing in red and green and gold, the colors of Christmas. It was love at first sight. I don't even remember for sure if we rode the train that day, but I do know that I have ridden on every single Disneyland trip since then. And there have been many. A few years ago I took my own 4 year old son for a ride on the Disneyland Railroad. It was still magic. 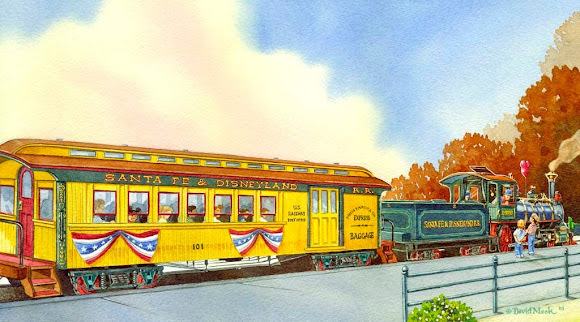 It's no secret that Walt Disney loved trains, particularly steam trains, and some form of miniature railroad was included from the very first in plans and drawings for Disneyland. As a young lad, he had worked on the Missouri Pacific as a news butcher, selling magazines, peanuts and candy bars to commuters. Much later, with the success of the Disney Studio and with help from studio machinist Roger Broggie, Walt built his own 1/8th scale railroad in the backyard of his home in Holmby Hills in 1950. Christened the Carolwood Pacific (for the street where the Disney's home was located, Carolwood Lane), the little railroad boasted 2,615' of track, a 46' long trestle bridge, and a 90' long tunnel under his wife's flower bed. A workshop was also built on the property in the shape of a rural barn. "Walt's Barn" became Disney's favorite retreat from studio pressures, and he spent many happy hours there tinkering away on projects. 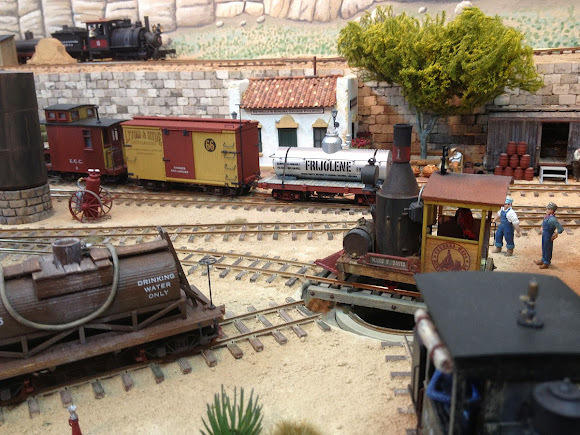 From that barn and the miniature railroad grew the idea for Disneyland. 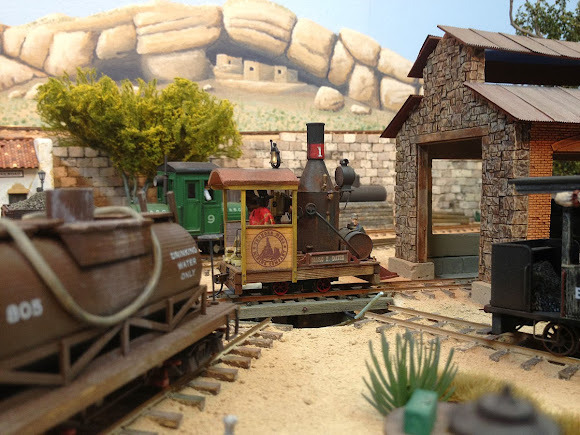 The Carolwood Pacific no longer exists but some of its original equipment, along with Walt's Barn and Combine 101 from the Disneyland Railroad, have been preserved by the Carolwood Pacific Historical Society. 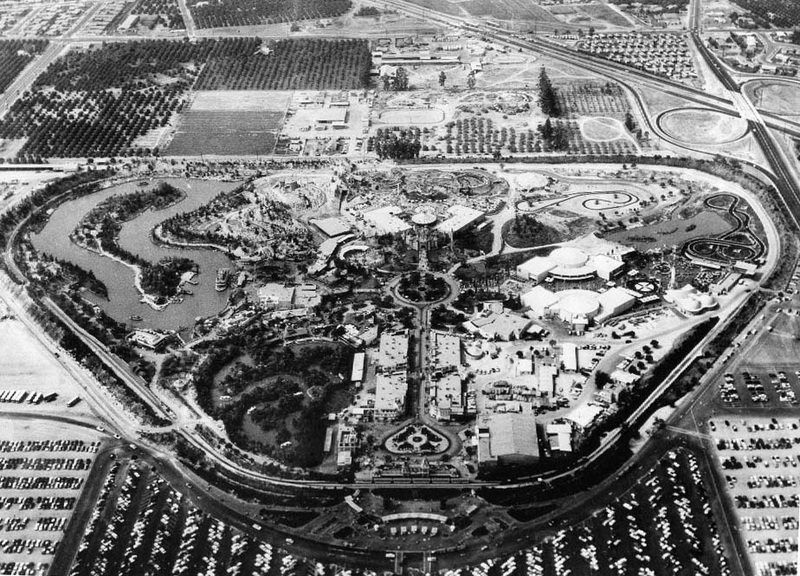 Construction of Walt's magical little park began in 1954, on the site of an orange grove in Anaheim, California. With the expert guidance of Roger Broggie and Earl Vilmer, the railroad was the very first attraction completed for the new park. 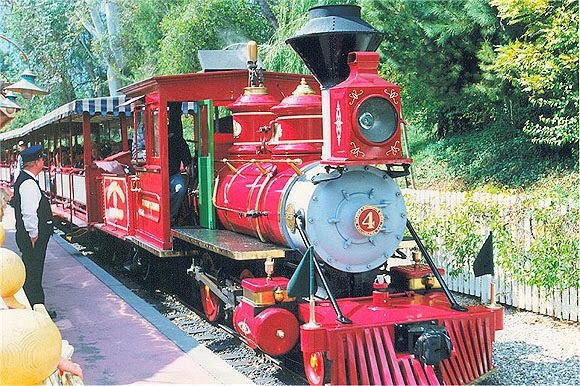 When Disneyland opened on July 17th, 1955, there were only two trains on the line: the Passenger Train, headed up by locomotive #2, the E. P. Ripley, and the Freight Train, powered by engine #1, the C. K. Holiday. Both locomotives were 4-4-0 American types, built at approximately 5/8" scale and based on scaled up drawings of Walt Disney's 1/8" scale Carolwood Pacific locomotive, the Lilly Belle. Mechanically, these first two engines were nearly identical, but cosmetic details like smoke stacks, domes and headlamps, placed each in a different era. 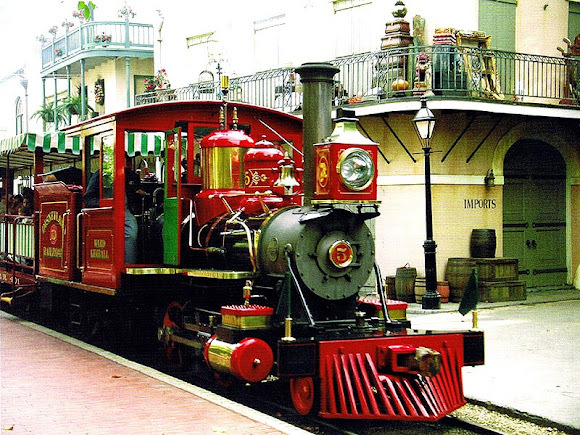 The Holiday was adorned as a locomotive of the 1880s, while the Ripley had the appearance of an early 1900s engine. 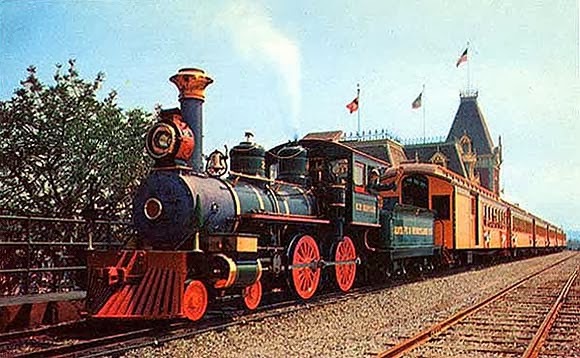 Today's park visitors may be surprised to learn that in those first years of operation, the Passenger Train only stopped at Main Street, and the Freight train could only be boarded in Frontierland. There were passing sidings at each station that allowed each train to make the complete "Grand Circle Tour" before returning to its station. So the Freight would pass right by Main Street Station and the Passenger Train would take the siding at Fronteirland and keep right on going! This operating scheme didn't last very long, however, and today you can board or de-board any train at any of the four stations along the line. 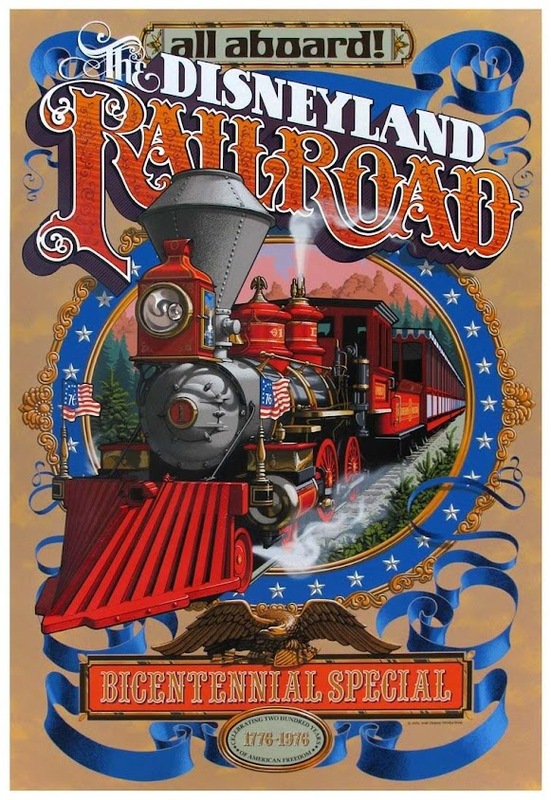 From 1955 through 1974, the Railroad was sponsored by the Atchison, Topeka and Santa Fe and both locomotives bore names in honor of that fabled line. The C. K. Holiday was named for Cyrus Kurtz Holiday, founder of the Santa Fe, while the E. P. Ripley honors a fomer president of the AT&SF, Edward Payson Ripley. 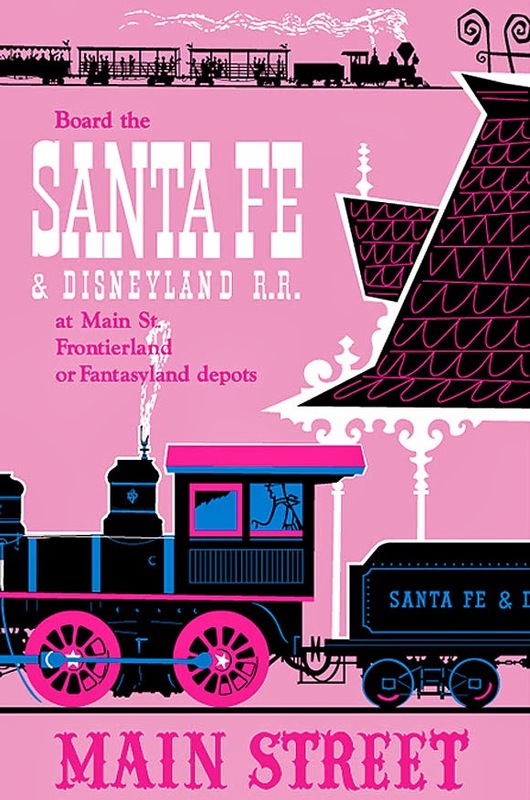 In those days, all equipment on the line was lettered for the Santa Fe & Disneyland Railroad and the distinctive blue and white heralds of the Santa Fe adorned each station. 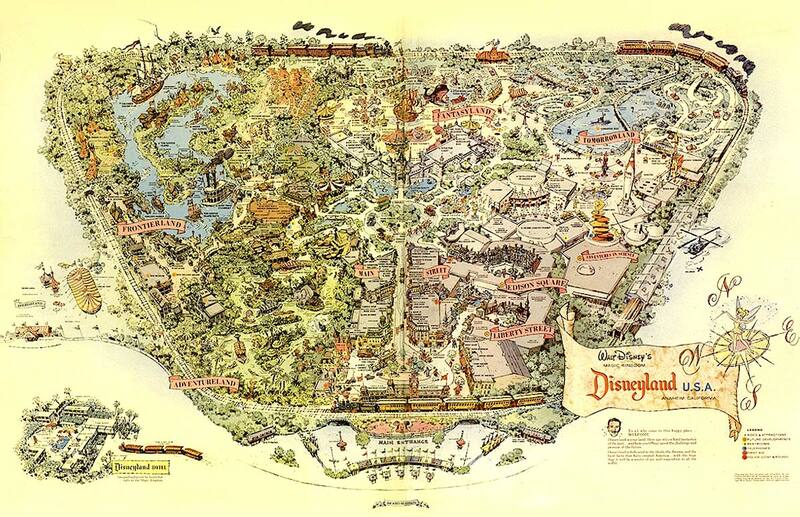 As the popularity of Disneyland grew, new locomotives and trains were added to the roster. 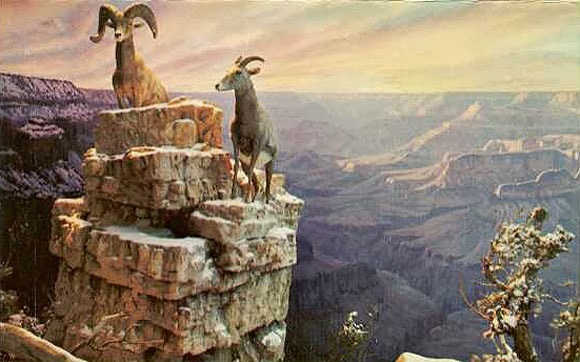 In 1958, engine #3, the Fred Gurley entered service, and the new open-sided excursion train came on line with the opening of the Grand Canyon Diorama. The Fred Gurley is a 2-4-4T Forney type locomotive and was named after the then president of the Santa Fe in 1958. The following year, engine #4, the Ernest S. Marsh entered service. This engine has a 2-4-0 wheel arrangement and was named for Santa Fe's chairman of the board in 1959. 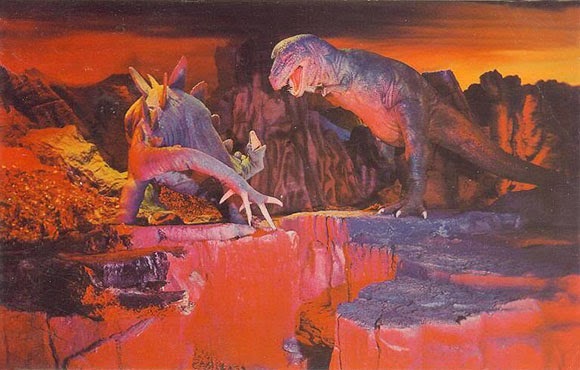 In 1966, Walt Disney expanded the Grand Canyon Diorama, adding audio-animatronic dinosaurs created by his imagineers for the Ford pavilion at the 1964 World's Fair. Sadly, the new "Primeval World" marked the end of regular use for the original yellow passenger train that had debuted with the park in 1955. 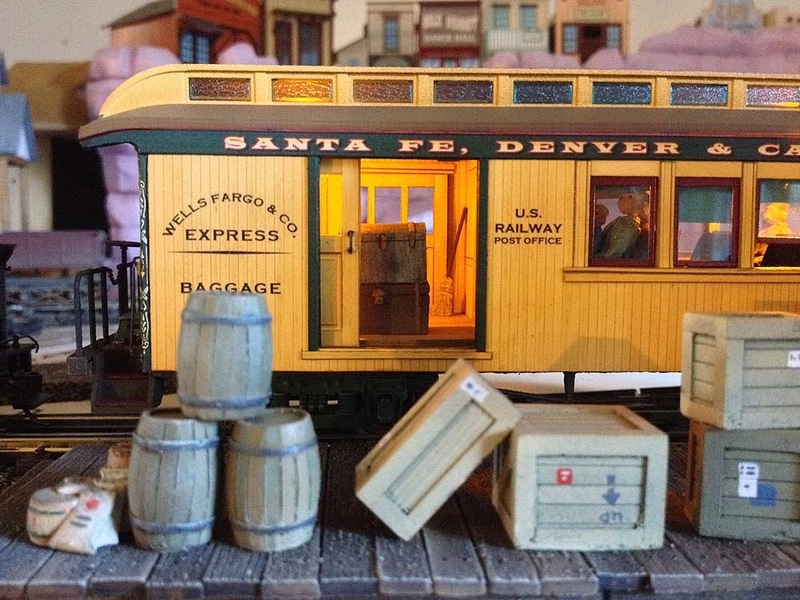 Though handsomely built and period accurate, the six car train was slow to load and unload, and small windows made it difficult for guests to see the dioramas. The train was slowly fazed out of use and retired permanently in 1974. Two new, open-sided trains were brought on line in 1966. Called Holiday Green and Holiday Blue by the crews, these cars have the familiar side facing benches and striped awnings that guests see at the park today. 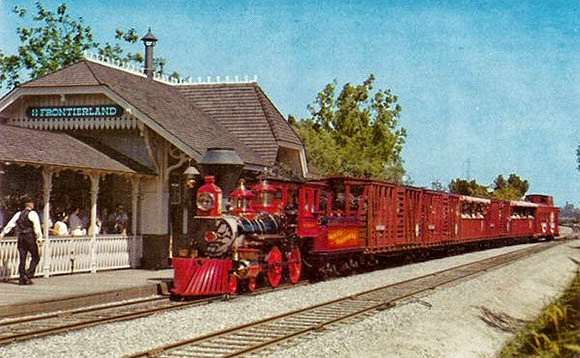 The original Freight Train was also retrofitted in a similar style and became the train known as Holiday Red. Retlaw 1 was the name given to the original Passenger Train (while the Freight Train was known as Retlaw 2). Retlaw wast the name of Walt Disney's private company that owned and operated the trains and monorails at Disneyland and employed their crews. Retlaw, of course, is "Walter" spelled backwards. Most of Retlaw 1 was sold off to private collectors. Four coaches are now owned by the Pacific Coast Railroad in Santa Margarita, California. The Retlaw 1 Combine, #101, was recently acquired by the Carolwood Foundation and is now on display near Walt's Barn in Griffith Park. 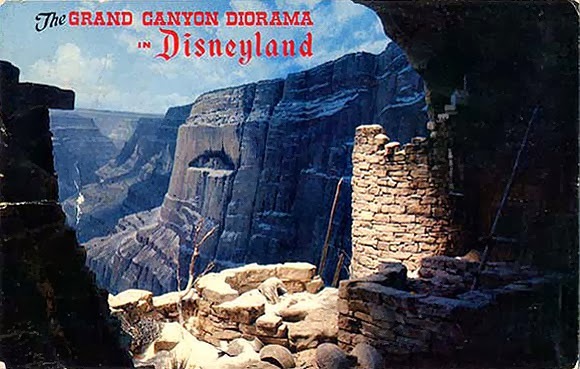 Only the train's excursion car, #106, Grand Canyon, can still be seen at Disneyland. It was restored and refurbished and now rides the rails as the opulent Lilly Belle parlor car. Today, as it always has, the Disneyland Railroad serves as a living history lesson in American steam railroading. Though small in scale, the trains are still powered by authentic steam engines, providing the same nostalgic journey that Walt Disney wanted for his guests all those years ago. And now, with the passage of time, they have also become a living reminder of Disneyland's past. Much has changed at the park in the last 58 years, but Walt's trains still roll on. And the railroad has grown. The track is longer now than it was in 1955, thanks to the addition of New Orleans Square, Critter Country and it's a small world. And just recently, a fifth locomotive has joined the roster: engine #5, the Ward Kimball. Ward was a great Disney animator and a true lover of trains, perhaps best known as the creator of Jimminy Cricket. 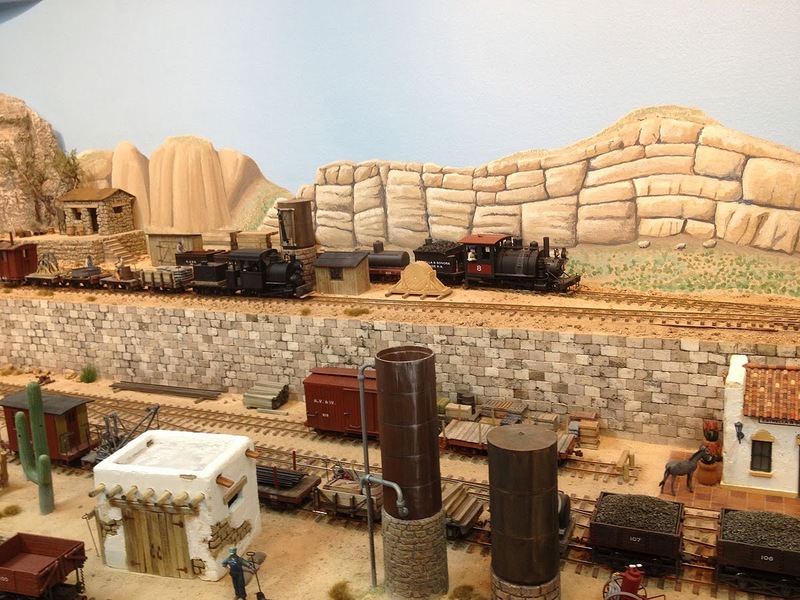 His own 3' gauge Grizzly Flats railroad is something of a legend itself - but that might be a topic for another post. 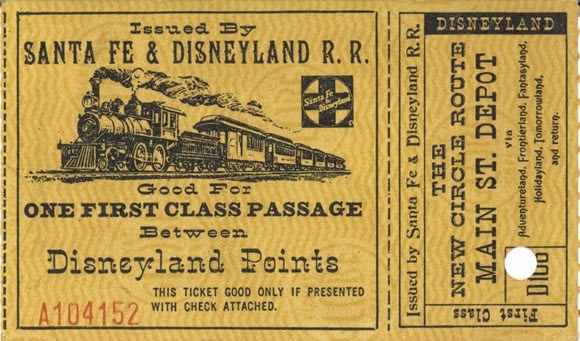 Much, much more could be written about the Disneyland Railroad, and, in fact, has been. Much of what I know about the topic comes from Steve DeGaetano's wonderful book, Welcome Aboard the Disneyland Railroad. The book is now, sadly, out of print, but his equally marvelous book on the Ward Kimball locomotive is still available. Maybe if enough people ask, he'll do another print run, or better yet, an updated and revised edition (hint, hint). So, gentle reader, the next time you are at Disneyland (or Disney World, or Disneyland Paris, or Tokyo Disneyland), please make time to ride the railroad as you hurry on your way to Space Mountain or Pirates. Its a wonderful, living piece of Disney history and a personal connection to Walt Disney himself. And, I think, if you've read this far, that kind of thing matters to you. As always, comments, questions and conversation are welcome. Welcome to the redesigned Thunder Mesa blog! In addition to a new look, the site also has several new features that can be accessed from the tabs near the top of this page. The Track Plan tab gives a view of the most up to date overall plan for the TMMC. 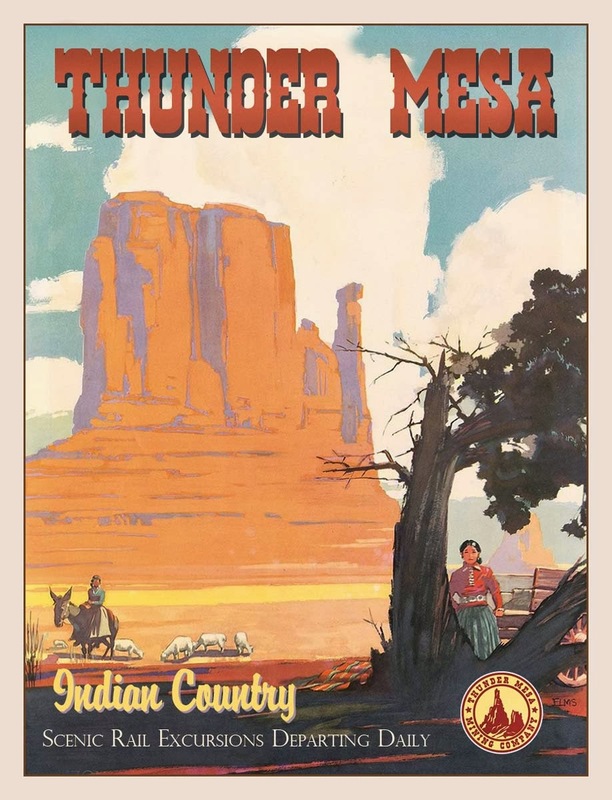 The Photo Album tab will take you to a slide show with the very best photos from Thunder Mesa country. The Layout Construction tab leads to a an ever-growing slideshow documenting the layout from bare-benchwork to the present day. The Videos tab is where to find large format versions of every video pertaining to the TMMC. So click around! Have fun and, as always, thanks for stopping in! 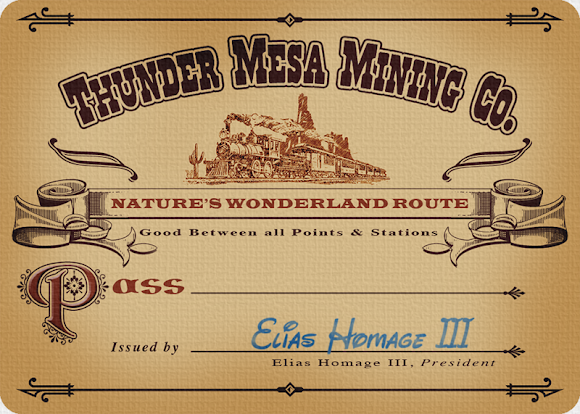 This rail pass is good between all points and stations along the Thunder Mesa Line - though you might have to shrink down to an inch and half tall in order to use it.